Best friend of bride, Bridesmaid Jessica, and Mother of the Bride, my beautiful Jenny. Grand Entrance into the Reception! Father of the Bride waits for the ceremony to begin. Bride with her Daddy dancing. The weather was perfect–cool and clear–the Bride and Groom were simply lovely. The wedding and reception were elegant and the food was delicious. What a wonderful event. Congratulations and best wishes to the happy couple. I love you. For lovely Granddaughter Amber and her handsome groom, Eric. The beautiful bride (left) and her equally beautiful mother, my Jenny. The Groom’s parents, hosts for the evening, Dan and Barbara. Bridesmaid and one of the bride’s best friends, Jessica and her husband Adam. A great photo of the groom, fourth from left; his brother-in-law and two sisters (bridesmaids) are to his left and his groomsmen are to his right. TMWLH converses with Maid of Honor, Ashley’s boyfriend, Lucas. The flower girl, Kylee, with her mother and Maid of Honor (and sister of the bride), Ashley. The Bride’s paternal Grandmother, Cathy. Bride’s maternal Grandfather and his wife, Alice. And the meal? Oh my goodness! I did not get any photos of the food presentations and I regret it. Not only visually delectable, but also delicious. A wonderful event at the start of the wedding celebrations. And so it has begun–the preparations. First, and most importantly, a proper wardrobe had to be selected. This morning, Poppy went to select her everyday attire. She selected a closely-cut copper/red velveteen-like coat with real fur cuffs and pink accessories. She did have her nails done, but prefers them ‘au natural’ especially for this adventure. Of most concern, of course, is Rush….the sororiety rush! Oh my, she so hopes she will be a popular girl at finishing school! So as a little practice, The Spicy Royal Red Paprika will spend two overnights with her friends at the vet kennels. A houseful of company will be visiting here, and she agreed it was a good time to spend her first nights away from home. But she is so excited about her upcoming finishing education! The Presbyterian Church hosted an all-day sale (indoors), petting zoo, baked goods sale today in Bellevue. Of course the Brocanters went! The proceeds were for Alzheimer’s research. Cupcake was in one of her ‘bossy’ moods again and hopped right up in the front seat. The littlest one of us! The rest of us were forced to ride stuffed together like proverbial sardines in a can in the back. Well, sardines are fishes. They are not, as far as I am aware, proverbial….but it might have to do with proverbs probably, although it could mean something like the proverb of the loaves and the fishes. Maybe proverbial sardines offer some sort of a lesson to the masses–said lesson might be to eat less? Oh I don’t know! We were crammed together in the back of the golf cart, holding on for dear life, the three of us: Thumper, Jabber and Vanna! Vanna wore the black boa because, of course, it coordinated with her outfit. She is our DIVA indeed. “Wait! Is she trying to impersonate Santa?” Jabber asked…..
No! She was luxuriating in the luxury of the white boa, Jabber! Finally, Thumper came out to talk with Vanna about including HER in the deal! And she did! Thumper and Vanna each purchased a purple Alzheimer’s T-shirt to benefit the charity. Thumper discusses the deal with Vanna and Cupcake. Finally, we were done. After our exciting ride TO the event, we decided to walk back to the car, which we did. Oh….what’s that you ask? The baked goodies that Vanna has in her lap? Cupcake bought us some zucchini bread and we ate that YUMMM! and Vanna took home some homemade cinnamon rolls. It was a fun sale and a good cause. We were glad we went. I love to repurpose things which I can’t use as they were originally intended….don’t you? The Pillow was also from a recent sale–$4! A Hunting We Did Go…. “A Hunting We Did Go, A Hunting We Did Go, Hi HO the Merry-O, A Hunting We Did Go!” Jabberwocky happily reminisced about all the fun things we saw today. “Not to mention the treasures we got, too!” Jabber said, but she didn’t mention. Yes, Weeders–it was Saturday and two of our favorite community sales were held today. We had to decide which one to choose…..it is always a difficult decision. But since Sosew lived in one community, we decided to go there first. Besides, she agreed to come with us if we would pick her up. So we did. SOSew found two pairs of Coach tennis shoes which Jabber REALLY wanted, but they didn’t fit Jabber. They did fit Sosew….Jabber still hasn’t gotten over it. They were so cute! Vanna found a Chico’s shirt which she promptly put on. Oh yes, she HAD on a shirt before, but she liked the new one so much she just changed shirts. The reason, she said, was that her first shirt was sleeveless and she wanted to cover up her ‘wings’. I informed her that we ALL had ‘wings’ and we should really be proud of them as they showed we were angels. Somehow this didn’t seem to make Vanna any more pleased. The shirt did, however. Cupcake was in a bossy mood today, too, telling everyone that she, and only she, would sit in the back seat. She planted her water container there in the holder and got quite miffed if anyone else tried to take her spot. Cupcake found some books which looked unread (but how does one KNOW they were unread I ask you) and some lovely pillows on which to lie while reading said books, unread or not. Yes, Weeders, a gen-u-ine silver birdcage on a stand! For $5. It’s perfect in the mint garden. Ignore Jabber. That was meant as a Joke, Jabber. We all know that a dog house is what a man is placed in should he misbehave. I don’t have one of those, but I DO have a kennel…. What did you ask? Oh…. Well, yes, it’s a mint garden. I do have some pots with herbs scattered in there, but the mint has taken over and I’ve let it, so I just call it my mint garden. Got a problem with that? If you do, then YOU come pull up all that excess mint. Besides, it does make a nice flavoring for iced tea. When I think of it…. And guess what? Cupcake was a Brownie and said her goal at that age was to grow up to be a Girl Scout! Girlfriend, when she saw this photo, said, “Well! You’d think she’d have BEEN a Girl Scout by now!” But no, she is a Cupcake instead. The Brownies were taking contributions for Happy Tails, selling cookies, and handing out goodie bags (for free!) for shoppers’ DOGS! Poppy was so thrilled when I came home and told her I’d found some things for her. These were $2 total. Two weeks ago, Jabber found another few of these, and then last week one glass, and this week four more. It seems that people all decide to dispose of their old items–the SAME items–at about the same time. Perfectly lovely summer glasses for fun. And Jabber just loves to have fun. And pretty things. And to drink wine…. Well, yes, that too. Three panels @ $10. New. Let me explain–Houdini made a portion of the drapes disappear in the office. We retired to Sosew’s for a lovely cup of coffee and bagels. Yes, yes. I did. What I meant was, Sosew hosted a little gathering at her house. We’d all had ENOUGH treasure hunting for the day. Besides, we’d already had to do a drop off earlier at Sosew’s as we’d filled up the van after only ONE BLOCK of shopping. It was also very hot by 10:30 or so and getting warmer. At the gathering, right in the middle of our very deep conversations about washing machines, Thumper put her hands up in the air, making circles with them as she is wont to do, and interrupted us for a word from our sponsor with a commercial. Thumper is wonderful at impromptu commercials. As we all know. And which I DID get on video. However, I regret to inform you that my very life has been threatened should I post such videos on this blog, so I won’t. You do know what the ‘Cone of Shame’ is, don’t you? Well, that phrase was made famous by Doug the Dog, in the animated feature film, “UP”…. 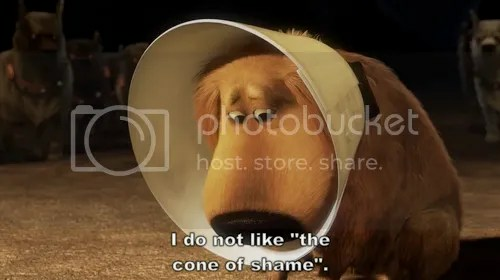 Indeed, most dogs do not like the Cone of Shame. The Royal Red barely escaped such a fate herself this past week. Only drugs helped her avoid the same. This meant we had a sleepy, loopy, large poodlette wandering around the house, sometimes staring into space and sometimes just collapsing and falling asleep almost on her feet BUT we avoided the Cone of Shame. A small rescue dog in our neighborhood, however, did not avoid the Cone of Shame. He came walking his person past our home this morning. His person explained that it was because he’d had fleas prior to his rescue and kept biting at said spots. The dog had had fleas……..goodness Weeders! I mean, otherwise, the man would have been wearing the Cone of Shame. He was not. So, his man initiated the Cone of Shame. The man mentioned he’d not ever heard that term before–actually there was a little bit of umbrage* in his tone when he inquired. The two dogs sniffed each other and the small one attempted to remove his Cone of Shame with both paws…..it wasn’t coming off….. I explained this was a reference to an animated cartoon (and that I had grandchildren–I didn’t bother to explain that it was actually my grown children who used that term more than once), he was somewhat relieved to hear the explanation. I said that the Royal Red avoided this because of drugs–she’d had her major surgery last week…. He grabbed up his small dog, cone and all, in his arms and remarked, “Well, it will certainly be interesting to see her grow up!” and he walked away. I wonder if he will be walking past our house again? Above, Spicy Royal Red Paprika (aka Poppy) relaxes on her throne pillow. *umbrage–note that I have been working on my vocabulary recently.